When you move you generally load up everything you own into one truck. If your entire life is ever going to get ripped off, this is probably when it’s going to happen. 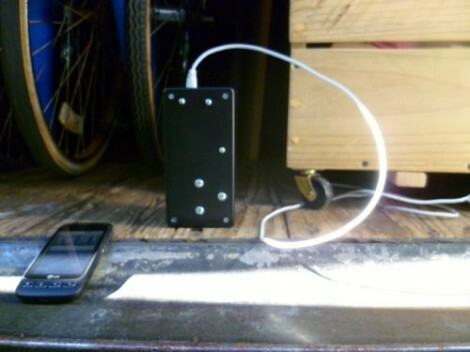 To guard against the threat [Tim Flint] built his own alarm for a moving truck. If someone opens the door on the truck it’ll alert him via text message. Hopefully he’s got an annoying notification sound that will wake him up in time to catch them red-handed. The setup is simple and shouldn’t distract you too much from your packing and loading. [Tim] connected a proximity sensor to an Arduino board which has its own WiFi module. The entire thing is housed in the black project box seen above and the proximity sensor is pointed at the moving truck door. When the door is opened the Arduino pushes an alert to Twilio which is configured to send him text messages. The alarm system doesn’t protect from someone stealing the entire truck… that kind of system is an entirely different project. [Billy’s] work got new keys which he didn’t want to carry around with him. 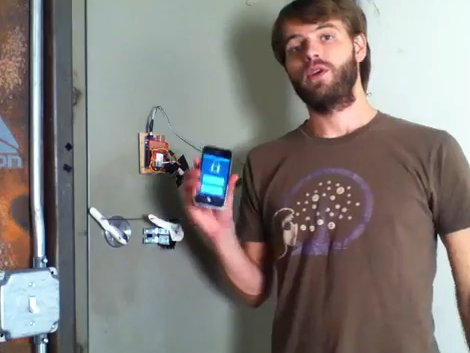 Instead he built this system to unlock the door via text message. 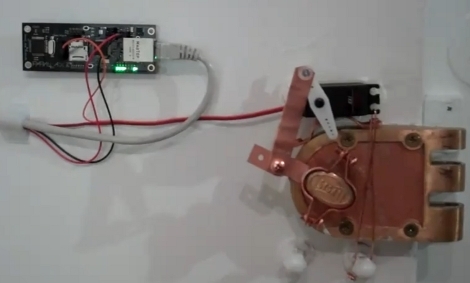 It is based around a Spinneret Web Server which drives a servo motor. He’s rigged up a pipe hanger to add some leverage to the lock’s knob. We’re surprised that the servo has enough power to do the job here but the video after the break shows there’s really no problem. On the communication side of things [Billy] set up Twilio to wait for text messages from an approved list of senders, then used an HTML form to issue the unlock commands to the webserver.